Do you know Millennials (80 million strong) are projected to inherit at least $41 trillion by mid-century? How can your Financial Services business attract the next generation of customers? Technology is changing, complexity is increasing, customers’ expectations are high and the competition is fierce in the Financial Services Industry. Those factors coupled with a new target demographic that is less brand-faithful creates big challenges. 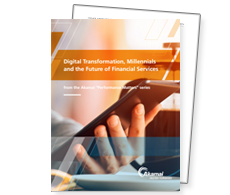 Millennials and the Future of Financial Services arms FSIs with key industry data and analysis on consumer performance expectations, banking and investing habits, engagement by device and reactions to dissatisfying web experiences.